It's grilling season, and do you think that as vegans, we don't enjoy the bbq? Well, if you think that bbq = grilled meats, it's time to expand your culinary horizons! This is actually the first summer that we have had a bbq. Before now, I used my small indoor grill, and even prop it outside during the hot months. But, there is no comparison to using a full bbq... and, since it really is an outdoor oven, you can grill and cook so many things! - Of course, wash the bok choy before using. Separate the larger leaves from the inner core, and trim the thick white ends. - As you get close to the small leaves, keep them intact with the core so they won't fall apart. - Toss all the leaves in extra-virgin olive oil. - Preheat your grill on medium-high heat, and place boy choy leaves on the grill, and season with sea salt and freshly ground black pepper (just a touch of pepper). - Close grill and let cook for a few minutes. Open grill and turn leaves. At this point, they will need just another minute or two. If the leaves have wilted and have a nice bright light green color, they will be just about ready. Let a few grill marks set on the leaves or stalk. 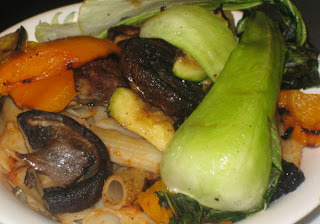 As you can see, when I grilled this baby bok choy, I also had other veggies that I grilled and served with pasta. I actually grilled the veggies in advance and then simply placed them on a pampered chef stoneware bar pan and warmed them through. You can do this in the oven, or again, on your bbq! (If you want to do the same, reheat the veggies until just warm enough to toss with the pasta... don't overcook). The bok choy was irresistible, and my husband and I kept reaching for extra leaves to nibble on as we worked through our bowl of pasta. Try it, with pasta... or all on its own! Now THAT looks delicious - yum!! I LOVE baby bok choy, never would've thought to grill it! Grilling baby bok choy? I never would have thought of it, but it looks like a great idea! I love baby bok choy! I recently had it for the first time, and now I always want it. I wish I had a grill! Love my Pampered Chef Stoneware products. Funny enough I've wondered if you use the PC products. The grilled veggies and pasta look delish. Nice summer meal. We've been grilling baby bok choy lately, too! It's so delicious, my 2-year-old LOVES it! I marinate it briefly in a mix of Bragg's and sesame oil and throw in on the grill. Perfect every time! The bok choy looks delicious. Did I also spot some portobello mushrooms on that plate? It makes me want to start grilling now! Vegnextdoor, I've only recently been using the PC stoneware - have 2 baking trays, one large, one small. I just wanted to get away from using *so* much parchment. I do love parchment, but want to limit it more for baking and for lining pans, than for using all of the time and for roasting veg, reheating things on pans, etc, etc. The parchment was getting expensive, and I was feeling a bit bad about how much I was using and ultimately throwing away! 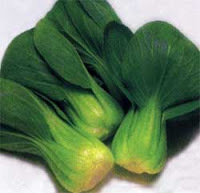 Chessa, like the sesame oil/Bragg's version - will have to give that a go too - a natural pairing for bok choy for sure! Jarreau, yes, we had portobellos - from our local farmers' market. They are organic and so fresh - actually I think this night they were crimini (which are essentially immature portobellos), but they were still pretty large! Plus we did peppers and zukes on the grill too - I love this kind of meal! Just wanted to drop a quick note to say congrats on your Radio debut. I listened through itunes and the info and history you shared was great. I'm new to veganism, converted about 4 months ago. Two questions for you as I was too chicken to call in... How do you cook for both an omni & vegan? My hubby is omni and I often cook 2 meals. What a pain! Any update on the vegan angel food cake challenge? I'm anxiously waiting, angel food cake is my annual favourite and this year was the first I went without. As for the angel food cake - I have updates - just not good ones!! :) I'm still working on it, haven't given up just yet, but no photos or exciting news to report - it's been a toughie!! Anyone else here have tips for Allison about eating vegan in a household with non-vegans??? not food related but every backpack i find my kids is 100% polyester. Are there cotton ones out there? What do you use for your kids?